I wanted to give a quick tour of my girls bedroom. My two oldest girls share a room together and I am in the process of making this a space that they both love. With our home being older, the bedrooms are on the small side. 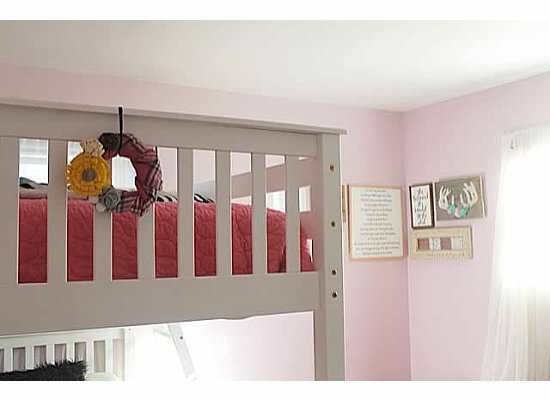 We opted for full size bunk beds (for top and bottom bunks) to give them plenty of room and to make them feel like they both have equal space. 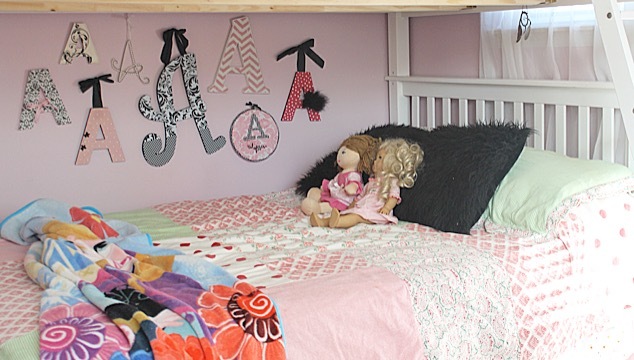 Their beds are made with their favorite pillows, stuffed animals, dolls, and blankets. I have kept their bedding minimal and easy for quick making in mornings. My middle daughter has her wall decorated with an assortment of A's that I have collected from various different stores. 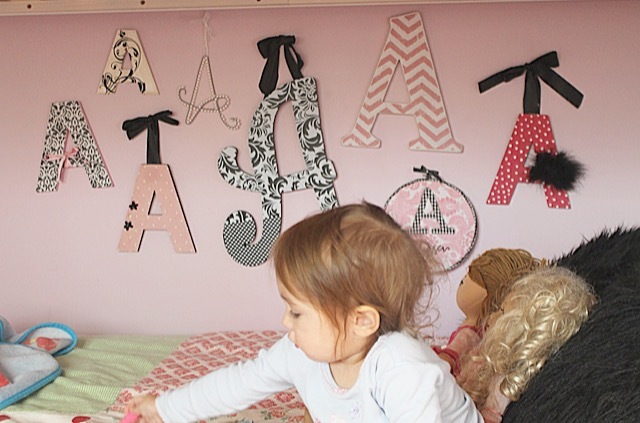 We are still in the process of collecting E's for my oldest daughter for her top bunk. 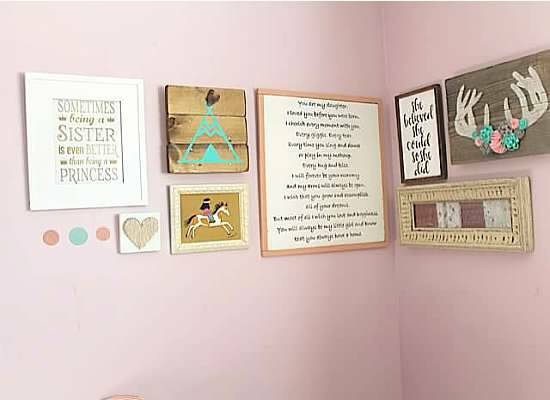 I started a gallery wall in their room using mostly all handmade items from friends on Instagram and from Etsy shops. I love shopping small not only because I am helping support someone's family, but because of how unique the items make your home. I have big plans for this wall and hope to complete it soon. I'm still looking for those special pieces to add! 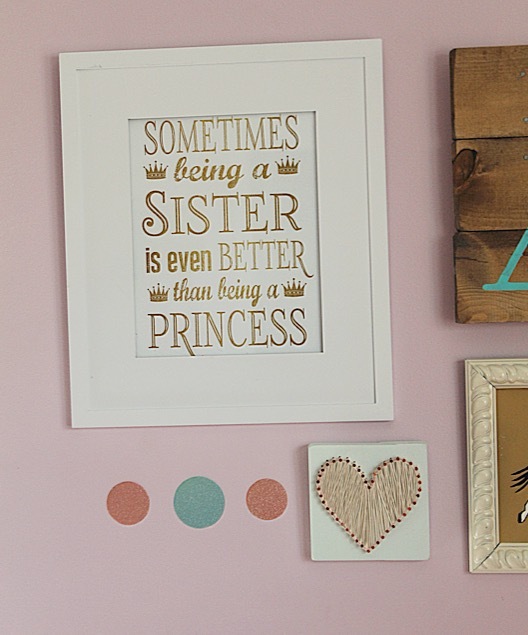 This "Sisters" print is from Bon Temps Beignet and the cute mini string art heart is from Nailed It By JJ. I wrote and hand painted this sign for my girls. This adorable tee-pee is from Art by Kelly and I found the little Native American girl print at a little shop while we were vacationing in New Mexico. I love to fill their room with positive messages. 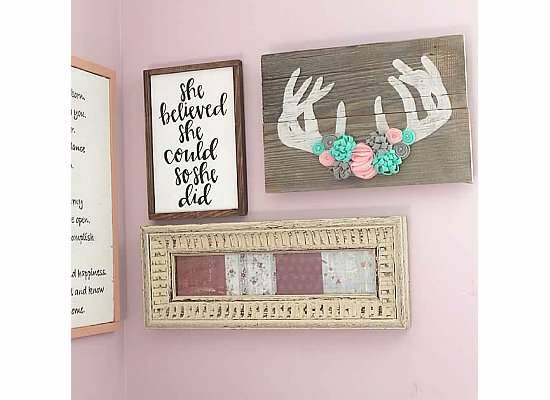 This "She believed" sign is from Hello Lou Lou One of my favorite pieces is this antler and felt flower wood art. My friend Jenny at Freckled Fancy Creations created this for me in the colors I chose. 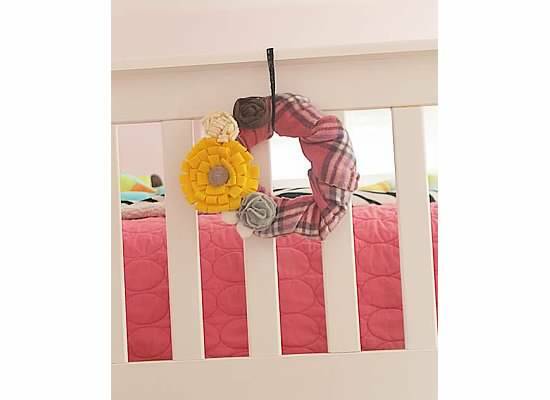 I made these mini wreaths with my girls out of an old scarf to wrap the foam, then I used felt to let them make the flowers. They picked their own colors and had so much fun creating these. 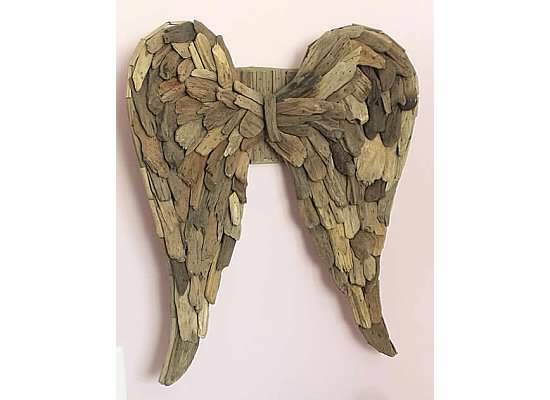 Another one of my absolute favorites in their room are these driftwood angel wings from Painted Fox Treasures. I was more than pleased with these when they came in the mail. If you are thinking of buying them for yourself I would highly recommend them. They add beautiful texture to the room as well. 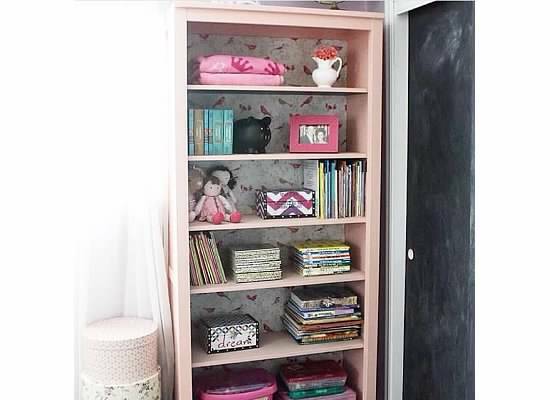 The closets in their room were the wood sliding doors that can be a bit of an eye sore. 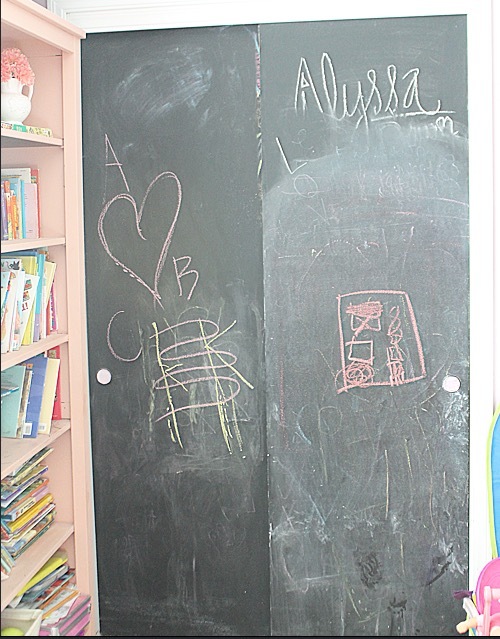 Instead of taking them down, we painted them both with chalkboard paint giving the girls a fun space to play and create. They are always playing teacher or writing their names on them. This old dresser used to belong to my grandmother. We painted it white and spray painted the knobs. I love the unique shape of it! 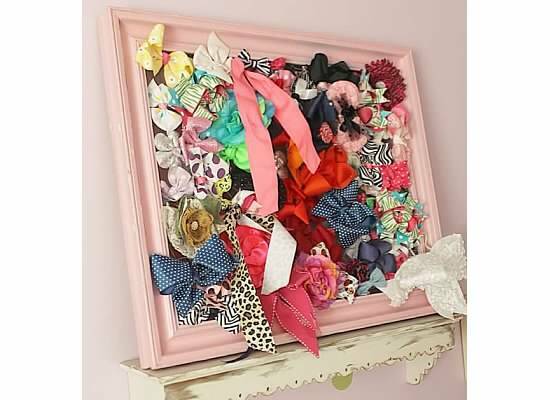 I made this bow holder out of an old frame and some leftover chicken wire we had in the barn. I hope you enjoyed seeing a little glimpse into our home. I have so many more plans for this space and hope to update you as I go along. This is beautiful! They are so lucky!!!! I wish I was little again! My fave is the chalkboard! Awe thanks Keila! It's their favorite too! 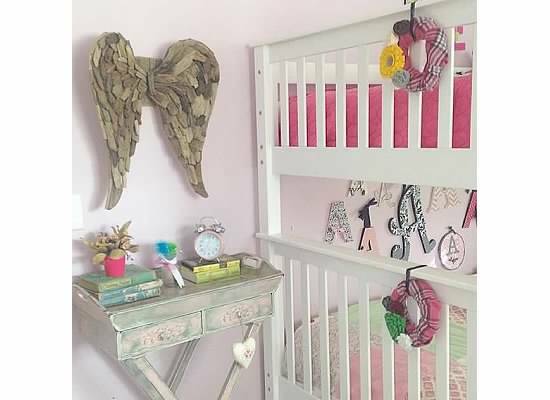 Such a cute room, what lucky little girls!! This is just the prettiest bedroom! 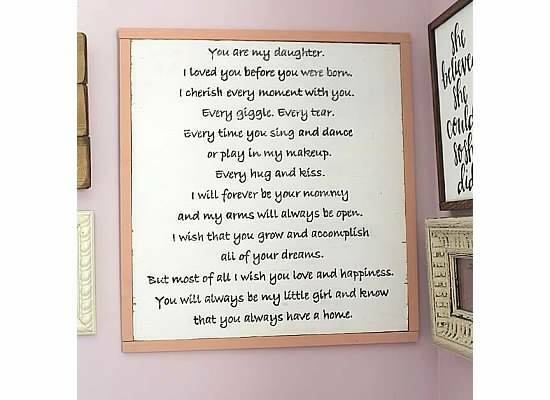 I know my girls would have loved something like this when they were little! I know I would have loved a bedroom like this when I was little. Heck, I'd love a bedroom like this right now!! <3 Just beautiful. I love everything!!! 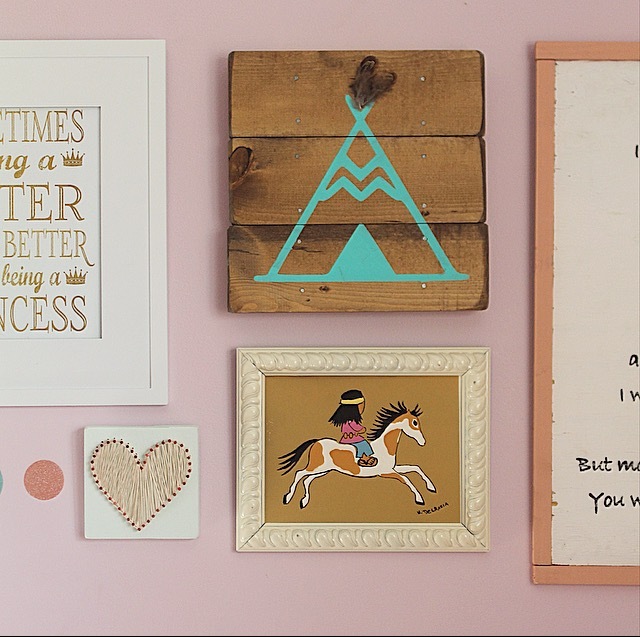 This will be a room your beautiful girls can grow up in! So pretty! 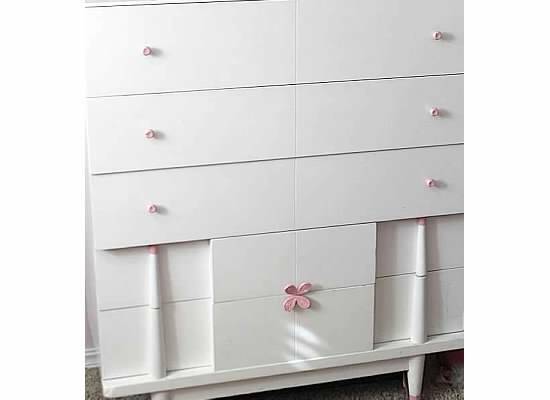 The perfect room for little girls! Such a cute and creative bedroom! Love the chalkboard! 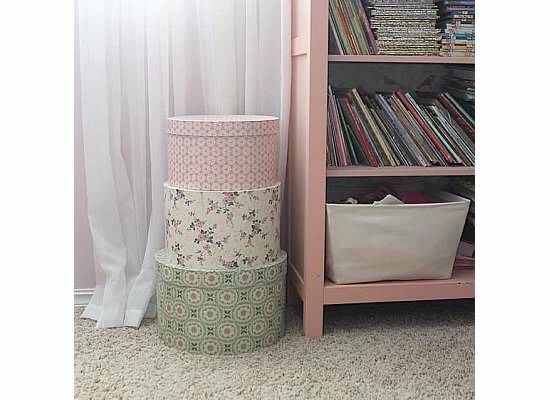 Awesome girls rooms,it's looking so beautiful,thanks for sharing.